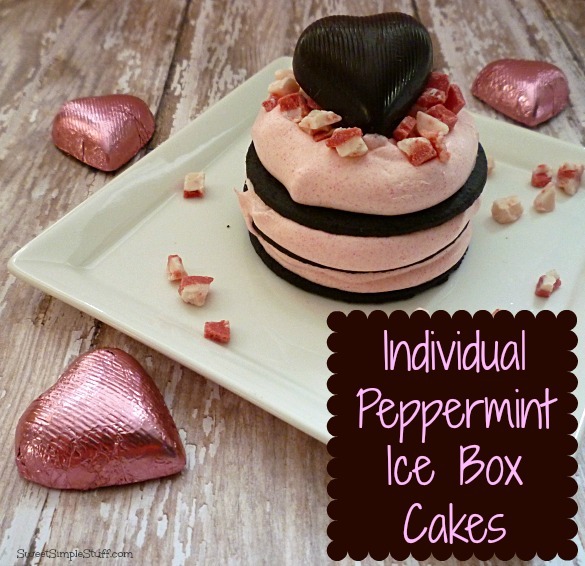 I love Ice Box Cakes and have been meaning to make individual ones! The combination of dark chocolate and pink is so pretty! 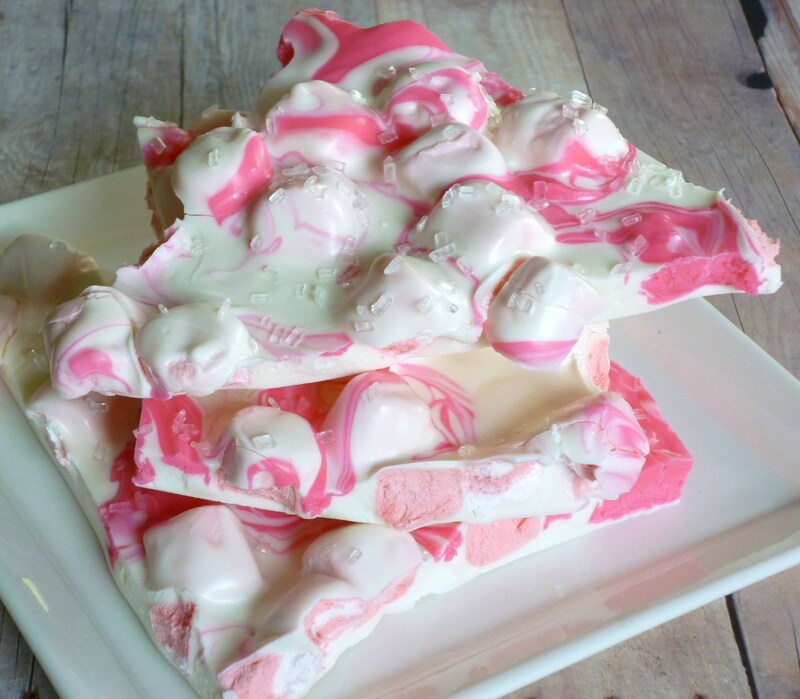 Peppermint seems like a good choice for Valentine’s Day … fresh breath is a good thing! I believe chocolate hearts are required on Valentine’s Day … at least in my book! These were soooo easy to make … you can make as many or as few as you want … love the convenience of individual servings. At Christmas time, I had seen Andes Peppermint Crunch Baking Chips featured in several recipes, but never saw them at my grocery store. Then, earlier this month I spotted them at Target … they jumped right into my cart and came home with me! I knew that I needed them for Valentine’s Day and with dark chocolate. 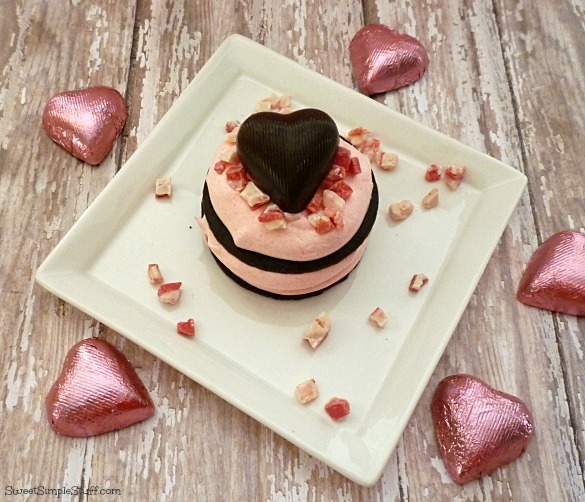 SweetWorks sent me some delicious (I know … had to taste test) dark chocolate hearts wrapped in pink foil … it was the perfect decoration for the top of these little cakes! Place medium size bowl and whisk (or beaters) in the freezer for about 10 minutes. Add cream, sugar and a drop or two of food coloring to cold bowl and beat until stiff peaks form. Add more coloring if desired. Cover a tray with parchment paper or cupcake liners. Place six chocolate wafers on prepared tray, add a spoon of whipped cream to each wafer, repeat two more layers (3 wafer and 3 spoons of whipped cream). Cover and refrigerate for at least 4 hours. 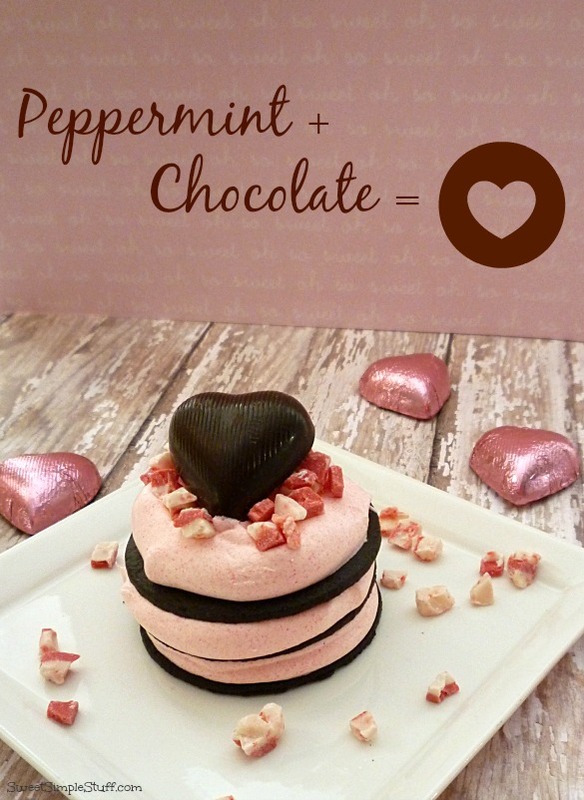 To serve, remove each cake and top with (about 1 tablespoon) Peppermint Crunch and a chocolate heart. Makes 6 servings. Hints and variations: Using the flattened cupcake liners makes it easy to remove from the tray and serve. You could also assemble the cakes on individual plates, cover and refrigerate. Don’t want to whip cream … substitute Cool Whip and eliminate powdered sugar. Substitute mini chocolate chips for the Peppermint Crunch. Thank you to SweetWorks for the dark chocolate hearts! these are so cute, and a great idea. would you flavor the whipped cream with peppermint? or do you think it wouldn’t go together? Thanks Melissa 😉 I didn’t flavor the whipped cream, but you certainly could … my only suggestion would be to start with a tiny amount because peppermint can be overpowering! If you do it, please share your results! These would be cute sitting on top of those red, heart shaped paper doilies. Thank you Colleen 🙂 Great ideas … as usual! These are so delicious looking!! Love the flavors! These are gorgeous! I bet they taste wonderful, too. Thank you so much 🙂 In my opinion … peppermint and chocolate are always a wonderful combo!